We live in a sad world surrounded by people who are questioning themselves and the importance of their lives, gripped by depression. 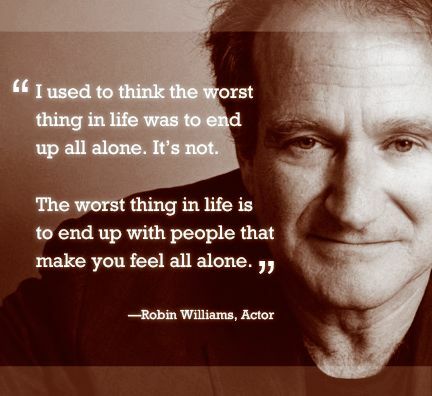 We need to reach out and provide positive encouragement, support, and love before it’s too late, like the recent tragedy with Robin Williams. I am not immune to the stresses of life. I struggle with decisions that I’ve made, the direction that I’m taking, if I’m a good mother, wife, sister, daughter, friend…. Readers often comment on my posts and say things like “must be nice”, “I wish it was me”, or “You are so lucky”, but they neglect to congratulate me on any of my successes. Rather than making me feel good about accomplishing my dreams, most times I’m left feeling discouraged and dis-heartened, like I’m doing something wrong because I’m following my passion. How is it that the more successful I am in accomplishing my goals, the more disconnected I feel from others? Why do I feel like I have to hide my happiness to connect with people? Why is it that my posts about failure are the most popular? Why? Robin Williams has died. I didn’t know him personally, but he brought joy into my life. 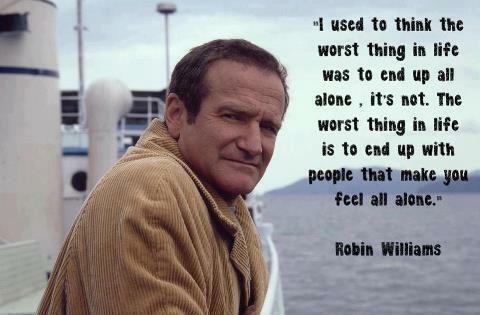 I loved his movies and his positive attitude. I assumed he was a happy man with so much to be proud of in his life. I would have loved to shake his hand and thank him for his contribution to entertainment. His smiling face and comedy brought light into the lives of others. The same can be said for a fellow bucket list blogger, Anita Mac. I read her posts with vigor and often wished for similar blogging success. Yet both of these people took their own lives because of depression. And the worse thing about depression is it’s ignorant. It’s ignorant to age, race, religion, culture, gender, and finance. Regardless of who you are, depression accepts you. It turns sunshine into rain and light into dark. It is a mask to the world. I wish I could have done something to help them. I wish I could take away their pain. I wish people didn’t need to suffer because they feel alone. I am deeply saddened by this loss. We can fill darkness with light. We can be a positive force in each other’s lives. I spend most of my days thinking about bucket lists and accomplishing my dreams before it’s too late. My bucket list isn’t about dying; it’s about celebrating life. We need to celebrate our lives and the lives of others on a regular basis. Have you been a positive influence on someone’s life today? If you accomplish one thing today, please let it be making yourself and others feel happy and loved. No one should feel alone. Go and hug your family and tell them you love them. Encourage them. Support them. Show them love. It’s the best thing we can do all day. Beautiful message. Thank you for sharing your perspective! Robin Williams touched so many people with his kindness, even brought up happiness to the sick, depressed, poor & handicapped. At the end made everyone happy except himself. I guess each and one of us died with the terrible lost of this great human being.